For Membership Resources, click here. For Relationships Resources, click here. 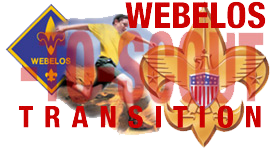 Webelos Den Leaders, Cubmasters, Scoutmasters, and Unit Commissioners all play a key role in Webelos to Scout Transition. Your goal should be to cross over 100% of your Webelos to a Boy Scout Troop. Pack 3011, Troop 11, and Crew 2011 are based our of Church of the Resurrection United Methodist Church in Leawood, KS and are sponsored by Matthews Ministry. Matthew's Ministry is the church's outreach program for youth with special needs and their families. Each program follows the Scouting program but provides activities at a pace appropriate for Scouts with special needs. They attend summer camp at Lake Jacomo, earn rank advancements, and campout throughout the year. Contact Jim Baska at myndirish@yahoo.com or CLICK HERE for more information.